The analysis aimed at revealing the specific location in the innovation process where innovation typically fails shows that significant parts of reality were likely not considered by those who presented the conventional funnel model of the innovation process. 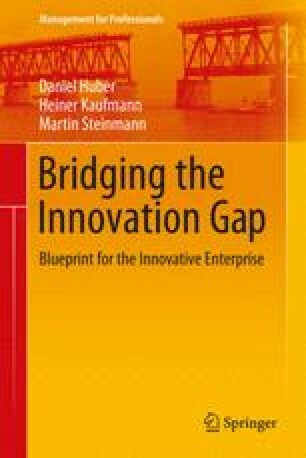 We refer to the most important missing component as the innovation gap. All illustrations are published with the kind permission of © Heiner Kaufmann, Daniel Huber, and Martin Steinmann. All Rights Reserved. Hinderling. (2013). http://www.kmu.admin.ch/aktuell/00524/00730/01247/index.html?lang=de. As referenced on May 11, 2013.